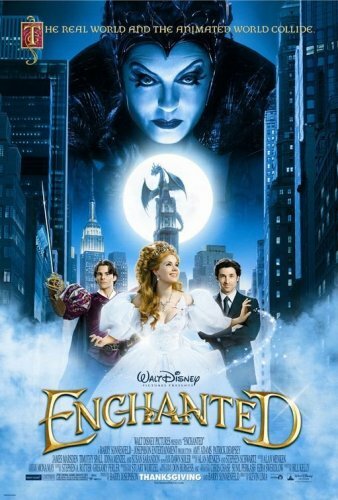 Enchanted was such a delightful movie that we have seen it twice at the theatre, and can’t wait for it to come out on video! What would happen if all of the typical characters in a Disney fairy tale (the heroine, the prince, the wicked witch, the bumbling servent, and even the cute animals with whom the heroine communes) suddenly found themselves in real life in current-day New York City? That’s the premise of Enchanted, and it does it amazingly well. And it is delightful to see Disney lampooning all of its own stereotypical ideals! First, to be clear – the characters become real as they arrive in New York – this is not animation interacting with real life, ala Who Framed Roger Rabbit, but rather the animated characters become real. Thus the heroine, once arriving in New York, is played by Amy Adams, the prince by James Marsden, and the wicked step-mother witch queen (yes, all in one) by the always-wonderful Susan Sarendon. Heroine Giselle is sent to the real world by Prince Edward’s (Marsden) wicked step-mother queen (Sarendon) on her wedding day, because Sarendon does not want to lose her position as queen of the throne. She emerges through a manhole in Times Square, and after a series of mishaps is befriended by way-too-practical-and-cynical lawyer Robert (Patrick Dempsey) and his young daughter Morgan (Rachel Covey). Prince Edward, played to perfection by Marsden as a sincere, but slightly vapid prince, follows to rescue his love. He is, in turn, followed by the queen’s doting and dopey henchman, Nathaniel (Timothy Spall) and Giselle’s equally doting chipmonk, voiced by both Jeff Bennett and Kevin Lima. There are also several scenes which find chipmonk Pip to almost be in peril – but only almost (although there is a visual of a sword held at his throat – also there is a scene where a sword is plunged into a bus – because Prince Edward believes it to be a horrible beast). It should also be said however, that the climactic ending may be too intense for younger children – it is very reminiscent of the scene at the end of Ghostbusters when they are battling Zuul on the roof. All in all, Enchanted far exceeded all of our expectations, and we cannot recommend it highly enough.